Kaila Hart of Durango DEVO's U19 team pedals along followed by teammates Hannah Madden and Joan Walker during a race in Nathrop in May. The DEVO program features multiple racing options for the older cyclists. More like visions of singletrack. Visions of singletrack rides through Horse Gulch or up Hermosa Creek. Visions of a panorama of wildflowers as the mountain bikers climb up and drop in at Purgatory. While snowboarders and skiers are dropping in at Purg now, Durango's junior mountain bikers are dreaming of spring, summer and fall bike rides. With their pals. On the team. 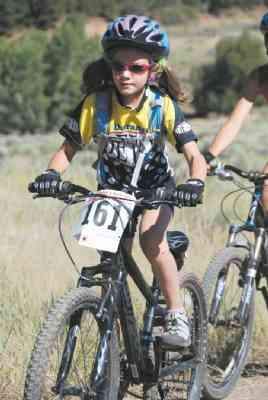 The Durango Junior Development Mountain Bike Team (DEVO for short) is pedaling into its fourth year in 2009. From modest beginnings with 10 eager bikers, DEVO is charging ahead with more than 100 young cyclists ready for ridin' and racin'. And fun. "I'm ready to race right now," said Kaila Hart of Durango, 17, who is eager to start her third season with Durango DEVO next spring. "I like the snow, I'm a skier. 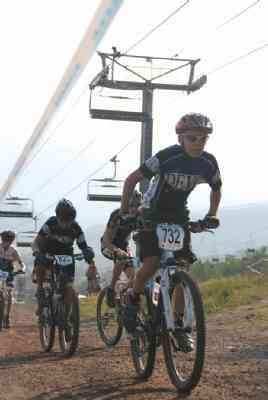 "But I miss (mountain bike) racing," said Hart, a junior at Durango High School. "I can't wait." The DEVO concept was launched by Durango's Sarah Tescher along with Chad Cheeney. "Sarah was riding with the kids at Miller Middle School," said Annie Cheeney, director of Durango DEVO and wife of Chad"She was riding with them a lot. And Chad would ride ... he's been riding his whole life; he moved to Durango to ride," Annie Cheeney said. "He saw the need for ... an organized team. Like the Nordic team. Like other teams for kids," she said. "People look at mountain biking as an individual sport. But they wanted to do it as a team," Cheeney explained. They wanted to capitalize on the energy and camaraderie of a team sport to help develop and enhance the experience for the individual riders, she said. "It started with ... 10 kids. This past season, we had more than 100. We had 116 at one point," Cheeney said of the mountain bikers ages 6 to 19. There are three divisions within DEVO, starting with Junior DEVO, for elementary school riders ages 6 to 10 or 11. "It's for kids interested in riding a mountain bike. Learning to ride. It's noncompetitive," Cheeney said, adding that basic bike-handling skills are stressed in the program. DEVO U14 is the second group, for middle schoolers in grades 6-8. "The level of dedication goes up (in U14)," Cheeney said. "There's a lot more riding." She said the U14 riders practice two to three times each week. The riders are encouraged to tray a race or two. And they take on more challenging terrain and trails. "And the team aspect enters here," Cheeney said. DEVO U19 is the top level, for high schoolers. "This is a competitive sport for them. They are training; they are racing; they are working with the team," Cheeney said. She added that DEVO U19 does five races as a team. And individual riders are encouraged to race in other events. Last summer, the DEVO riders competed in the Escalante Days Mountain Bike Race in Dolores as a team. They also race in the Mountain States Cup Series. "Those races are a total blast," Cheeney said. "The team really comes together out there (at those races)." Hart echoed Cheeney's comments on the regional races and the fun of racing and working as a team. "My friend Joan (Walker) joined DEVO first," Hart said. "She said it was a race team. I wasn't sure if I wanted to race. "But it was fun to ride with girls who ride like we like to ride," she said. "It's fun to be with people who enjoying being on their bikes," Hart said, adding that after the first race she was hooked on DEVO. "Racing gives us big goals to work for," she said. "You learn to push yourself." She said the DEVO program has improved her biking skills beyond her expectations. "Like 100 times better. It's ridiculous how much it's improved," Hart said. She said she's also learned a great deal about race training and preparation. "You learn how to be prepared," she added. Cheeney said DEVO also stages training camp retreats, including the popular Top Secret Training Camp, held last year in the secretive location of Aztec, N.M.
"It was a huge success. We had so much fun," Cheeney said, crediting Russell Zimmerman of Durango Cyclery as the camp host supreme. She said the program has benefited tremendously from the Durango cycling community. Many pro cyclists and former pros have served as guest riders and mentors to the Durango DEVO riders. "The local pros have been huge supporters of the DEVO program," Cheeney said. "They are supportive and encouraging ... above and beyond," she said. Shonny Vanlandingham has been a constant presence with the DEVO riders. The former pro mountain biker and current professional triathlete is a favorite of the young riders, Cheeney said. "Shonny ... has been wonderful," she said. Many, many other pros have joined the DEVO riders on local trails - cyclists like Ned Overend, Todd Wells, Travis Brown, Elke Brutsaert, Greg Herbold, Tom Danielson, among others. "We went out and learned ... some downhill racing with Elke," Hart said. "She's amazing. She kind of held back, but when she would take off you could see just how fast she is," Hart said of the former world champion downhill racer. "In Durango, we've got the most pro bike riders per capita," Hart said. "We've ridden with so many famous riders." Another point of emphasis for the entire DEVO program, Cheeney said, is trail etiquette. "We encourage them to have good trail etiquette. We stress that," she said. Durango DEVO riders also participate in local trail projects. "We do trail work days with Trails 2000," Cheeney said. "We want them (DEVO riders) to ... appreciate the trails they ride on." Last October, the DEVO riders joined Mary Monroe and the Trails 2000 group for cleanup and trail work in the Goeglein Gulch area and in Horse Gulch. But first and foremost, Durango DEVO is about mountain biking. "It's definitely all about mountain biking. The riders are encouraged to do other racing, too. But this is mountain biking," Cheeney said. "Our mission is to develop each kid so biking can become a lifelong sport." She said Durango's parents have grown to appreciate a program that teaches their children to mountain bike with safety and courtesy. "There are a lot of parents who mountain bike here," she said. "Our kids ride with us and practice ... and then they can go out and show their parents what they've learned," Cheeney said. The DEVO program includes spring, summer and fall seasons with registration before each season. Registration for all seasons in 2009 is open now. Scholarships are available. "The local pros have been huge supporters of the (Durango) DEVO program."